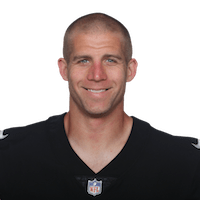 Published: Oct. 7, 2018 at 06:49 p.m.
Oakland Raiders quarterback Derek Carr connects with wide receiver Jordy Nelson for the Raiders' first touchdown of the game on a 1-yard pass. Published: Sept. 30, 2018 at 06:56 p.m.
Oakland Raiders quarterback Derek Carr slings a pass to wide receiver Jordy Nelson for a 19-yard touchdown to take the lead. Published: Sept. 23, 2018 at 01:34 p.m. Published: Sept. 23, 2018 at 01:21 p.m.
Oakland Raiders Derek Carr spots an open window to wide receiver Jordy Nelson for the first touchdown of the game.